STX Entertainment and Lakeshore Entertainment have arranged a once-in-a-lifetime experience for fans to see the new horror movie "The Boy" at 15 exclusive red carpet screenings before the general public has an opportunity to see the film. The PG-13 rated motion picture opens in theaters nationwide on January 22. All 15 screenings will occur simultaneously and will take place on one night only – Jan. 20 – starting at 6 P.M. ET / 3 P.M. PT. Tickets to this event are now available online at TheBoyFanPremiere.Movie. The announcement was made on Jan. 12 by Jack Pan, President of Marketing for STX Entertainment. Attendees will have the opportunity to walk the red carpet with their friends, mingle and engage in activities with other fans, meet and take photos with some of their favorite social media stars, and see the movie with them. Each screening will be hosted by at least one of the country’s most popular social media personalities. Before the movie begins, a live stream will simulcast across all 15 theaters nationwide. Attendees will see themselves, their social media host, and fellow fans from around the country on the big screen, and have the opportunity to ask questions to the film’s star Lauren Cohan, who will answer in real-time. 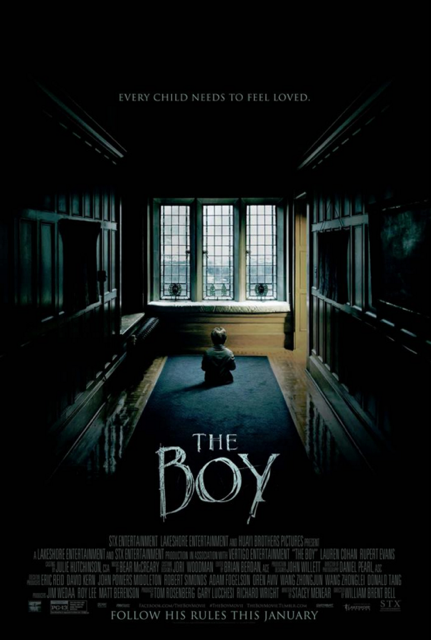 "The Boy" is a frightening PG-13 rated film directed by William Brent Bell (The Devil Inside). In the film, Greta (Lauren Cohan) is a young American woman who takes a job as a nanny in a remote English village, only to discover that the family’s 8-year-old is a life-sized doll that the parents care for just like a real boy, as a way to cope with the death of their actual son 20 years prior. Written by Stacey Menear, the film is produced by Tom Rosenberg, Gary Lucchesi, Roy Lee, Matt Berenson, Richard Wright and Jim Wedaa.